Denise Alexander-Pyle, a native and long- time resident of suburban Detroit, resides in Marion, Indiana with her husband of 25 years, Stephen in the unique home they built in 2006 after he retired from General Motors and returned to his home town to assist in running the family farms. As an attorney for now over 41 years, Denise continued to commute between her prestigious boutique family law practice in Birmingham, Michigan and Marion until September of 2015 when God and circumstances required that she remain in Marion full time, where her heart, their family, all reside. She maintains an office in Marion, where she can still practice some law, but with time allotted to continue to provide service to her community and still enjoy her grandchildren and other hobbies, such as cooking, art and writing. Denise received her undergraduate degree at the University of Michigan and hew law degree from the Detroit College of Law, now known as Michigan State University School of Law. However, it was her sister’s high conflict divorce when Denise was still in high school that compelled her to alter her career choice to become a journalist and instead become a divorce attorney. As an expert in the field of family law, her compassion and common sense personal counseling and coaching skills were actually her greatest asset to help clients through a crisis period in their life. Although raised and still a practicing Jewish, Denise has been a self-directed student of spirituality since she was 14 and also attends church with her husband describing herself as a New Way Jew, in part because she sees Jesus as the Way to God and understands that love and Christ consciousness are an integral part of man’s existence on Earth. Given the divisiveness in our world today, she believes the time is fast approaching when, no matter our beliefs, we must come together as “the all and the one,“ if we are to survive on this planet.” Back in 1990-1991, Denise taught Sunday school for two years to 15 year olds in Confirmation Class at a reformed Temple in Michigan, where the emphasis of the curriculum was Judeo-Christian ethics and living the Ten Commandments in modern times. 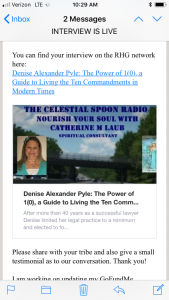 The latter topic has been a several decade long passion which culminated in her book entitled “The Power of 1(0), a Guide to Living the Ten Commandments in Modern Times.” The (0) is in parenthesis because she believes that even without the Ten Commandments, we have the Golden Rule to guide us and the underlying principle for all we do. The premise is also that if we peeled back the layers and understood the meaning of each of the Ten Commandments on multiple levels, we would truly recognize that we must adhere to them as our “rules of the road” for peaceful co-existence and survival on this planet. Denise tries to incorporate these principles in her life. Community and public service is important to her. She has served as a planning commissioner for two different communities, a council woman, and on several non-profit and professional boards. In 2007, she received the Circle of Hope award for her service to Care House of Oakland County, serving families and victims of child abuse. Over the years she has also written and had published various professional articles as well as opinion pieces and believes that life is a life-long learning journey. 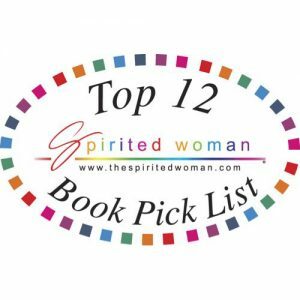 SHATTERED WOMEN RISING! JOIN TODAY! Dreams in the Bible – We get our messages from God in our sleep!